Kenyai O’Neal and PaviElle French in dat BLACK MERMAID MAN LADY. Photo by Rich Ryan. Editor’s Note: due to an injury to a cast member, Pillsbury House Theater decided to mount a “reader’s theater” version of the play. I.e., script-in-hand. This is the version being reviewed by Mari Wittenbreer, below. HWTS will use its best efforts to revisit and review dat Black Mermaid Man/Lady in its fully produced form. Dat Black Mermaid Man Lady/The Show is a performance piece about becoming. It’s about coming out of mourning, and it’s about coming north in the great African American migration, and it’s about coming of age. It opens with the cast singing a grieving song “I wish I Had One More Moment with You” and ends an hour later with a song of stomping, clapping praise. This is also a work about coming to sexual maturity and identity. It is shot through with proud racial identity. So it is that playwright Sharon Bridgforth casts a very broad net during her one hour show. It is a great deal of ground to cover. For the most part, this is a narrated piece with actors explaining situations rather than performing scenes with dialogue. 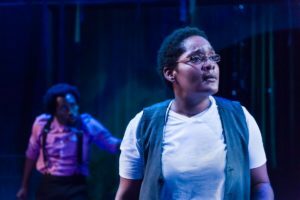 Actor Kenyai O’Neal says, “A story that used to be a straight line is now a circle…” this is true in its obvious meaning, the play is a circular journey. It also cleverly applies to the play’s sliding scale of gender identification. A fine wordsmith, Bridgforth uses both song lyrics and prose to tell her story. Man Lady is aided by a musically gifted four-person cast (Aimee K. Bryant, Florinda Bryant, PaviElle French, and O’Neal). Overall they do a good job with their lines but it’s hard to judge the cast’s acting skills because the opening night the performance was hampered by an injured cast member who couldn’t walk. The decision was made to go on with the show and perform the work as a readers theatre piece, without most of its blocking or stage business. The cast and crew deserve credit for being willing to adjust and carry on. Michael Wangen delivers a very nice lighting design, the bright white of a neon moon gives a special glow to the proceedings. The set by Christopher Heilman shows great promise with a kitchen area at one end of the stage and what appears to be an herbalist’s cabinet on the opposite end. Blue and green streamers hung from the ceiling give the audience the sense of being submerged. This all lends evidence to the hope that what the ambitious narration lacks in clarity could be conjured up in the blocking and stage business that had to be left out on opening night’s performance. Watch this space–I will try to make it to a later performance of Man Lady to give a Part 2 of this review. It’s worth it.